FCC Moves To Cut High Cost Of Prisoners' Calls Federal regulators want to cap the cost of phone calls from prison, which are far more expensive than ordinary calls. Commissions paid to local and state officials drive up costs, a phone firm says. Federal regulators will vote on capping the cost of phone calls from prison, which are far more expensive than ordinary calls. It costs a lot of money to talk on the phone to someone in jail — so much that those phone bills have drawn the attention of federal regulators. Now the Federal Communications Commission is set to vote Thursday to limit the price of prison phone calls. "We're cutting off necessities, just so we can keep this communication going," says Miguel Saucedo, a Ph.D. student and community activist in Chicago. His brother Luis is in prison in Illinois, where he has been incarcerated since 1996. For roughly 20 years, Miguel Saucedo and his family have been setting aside money to talk to Luis on the phone — money that could have gone to those necessities. Saucedo doesn't know exactly how much his family has paid over the years. But he estimates "it would have to be" over $10,000 or $20,000. For most of us, those phone calls would cost just a few cents per minute. But for inmates and their families, phone rates and fees can be many times higher. It's common for them to pay $13 for a 15-minute call. "I see the clearest, most egregious case of market failure ever," says FCC Commissioner Mignon Clyburn, who has been working on this issue for several years. "This is a major cost that families pay. And these families are the most economically vulnerable in our nation." This is a major cost that families pay. And these families are the most economically vulnerable in our nation. Inmates and their families are — all joking aside — pretty much the definition of a captive market. Just about every jail and prison signs an exclusive contract with one telephone company. For more than a decade, activists have been pushing the FCC to regulate those contracts. Two years ago, the commission moved to place caps on interstate calling rates. And Thursday, the commission will vote on a proposal to cap the rates and fees that inmates' families pay for all calls. But the prison phone industry is poised to fight back. "It's financially borderline catastrophic," says Brian Oliver, CEO of Global Tel*Link or GTL, the biggest player in the market for prison phone calls. He says the FCC's proposal would slash his revenues by as much as half. If the commission really wants to do something about prison phone rates, Oliver says, it should go after what are known in the business as site commissions — what activists call kickbacks to the county sheriff or state corrections department. Oliver says site commissions can account for as much as 60 or 70 cents of every dollar an inmate's family spends. "Rates are high because people want commissions," Oliver says. "And the people who set the rules, the counties and the states who want that income, directly create the high rates. When there are no site commissions, the evidence is clear: Rates become extremely affordable." Some states — including New York, Ohio and Rhode Island — have already outlawed site commissions. 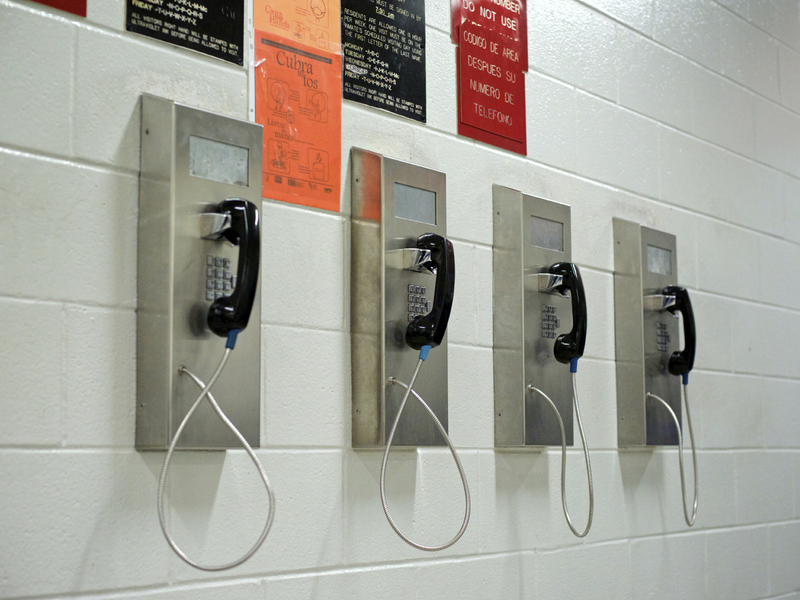 In those places, the FCC says prison phone rates are down. And call volumes are up. The people who run jails and prisons defend site commissions. Jonathan Thompson, the CEO of the National Sheriffs' Association, says sheriffs have to make sure that inmate calls don't create a threat to the community. And that takes money. "You're monitoring that phone call. That takes manpower, that takes time," Thompson says. "We're looking at upping the number of calls, right? But yet, not increasing capabilities or the resources that go with it. That is a huge challenge for sheriffs." Thompson says some sheriffs will likely stop allowing inmate phone calls at all if the FCC votes to cap rates. But regulators insist the proposed caps would still leave counties and states with enough money to cover their security costs. And activists like Miguel Saucedo say rate reform might actually save states and counties money — in the form of lower recidivism rates among people like his brother, Luis. "Us having that line of communication is vital for him to rehabilitate," Saucedo says. "And for me to cut that line off for him, and say, 'Sorry Luis, I can't answer your phone calls this month' — it's not imaginable. It cannot happen." Saucedo applauds the FCC for finally moving to regulate prison phone rates, but he and other activists may have to wait even longer to see any real-world effects. The prison phone industry is expected to challenge the proposed caps in court.